The first Macpac child carrier we owned, I found in a charity op-shop in Katherine on our first Big Lap of Australia with Maya when she was just 5 weeks old. Although she was tiny, I had no idea how quickly she was going to grow and we planned to be away for a long time, so added that old ‘Possum’ carrier to our growing pile of baby gear. Alas, before Maya even road-tested the thing, it took a tumble off the top of the 4WD while off-roading into the Bungle Bungles (one delirious, sleep-deprived Dad forgot to strap it on). When Maya was about 10 months old we shopped around for another and finally came back to the Macpac ‘Vamoose’. As a gear reviewer and user, I’ve always appreciated Macpac’s quality, and people who own their gear always seem to have good things to say about them. Sure, their purchase prices are a little steeper than most, but to me, that’s reassuring because I’d rather pay upfront for quality gear than be stuck somewhere remote when my ‘bargain’ fails me. What’s so great about the Vamoose? Versatile harness sizing: the Vamoose comes in two sizes so we bought the longer back length so that both David and I could carry Maya and we could swap her between us. This was not only helpful on long bushwalks, but also gave us greater versatility on backpacking trips when there was another pack to carry too. The child seat is also adjustable: it’s a little like a sit-up hammock that can be lowered down as your child grows. Super comfortable for me: I have no tolerance for uncomfortable gear so really appreciated the Vamoose’s super-comfy harness and wide hip belt (it really does fit like a proper backpack). We’ve always tackled long, rugged bushwalks, but as Maya got bigger and heavier, the extra padding on the harness was a godsend. Lots of storage: I really appreciated the big storage compartment under the carrier when we headed to SE Asia when Maya was three. We travelled with just one other pack so were able to carry Maya and most of her gear in the big roomy space under her seat, easily accessed by a single zipper (including the soccer ball Dad picked up in Burma). When flying, we always presented the Vamoose at check-in as our piece of free equipment for children. Every airline we’ve travelled with so far has allowed this but occasionally we’ve had show staff that it’s a child carrier, not just a backpack (fronting up with Maya still in the pack always works). The Vamoose comes with a little zip-off daypack too, which was handy when backpacking (I used it as my carry-on luggage on flights because it fitted my laptop nicely, along with the requisite snacks, wipes and toys). What’s not so great about the Vamoose? Additional extras: I bought both the sombrero sunshade and the rain cover and never used either. For starters, I found the sunshade a bit fiddly to put on and really bulky for travel and Maya wasn’t fond of being enclosed by either shelter, which made conditions very humid for her (we do live and travel in the tropics though). In other climates, I suspect the rain cover would be a necessity and that kids might well snuggle comfortably inside. Instead, Maya preferred the shelter of a big hat and a lather of sunscreen, and when we did get caught in the rain, a folding umbrella over the two of us worked a treat. Foot stirrups: As Maya got bigger and her legs longer (around three years of age), she was always looking for somewhere to rest her feet (many times we thought about stitching on some stirrups to prevent her legs from dangling when she fell asleep). ** This is not a sponsored post, I just really like this piece of gear and think other parents will too. The Vamoose Child Carrier lets you take your little explorer along for the adventure. This market-leading child carrier has been taking children along for the ride for many years and has been updated for 2016 to even further enhance comfort. This season, it has a simplified frame, reduced weight, improved stability and a fun and colourful ‘Kiwi’ cockpit print. Strong and durable, the Vamoose has a storage capacity of 19L and can handle loads of up to 20kg. It’s comfortable for both parent and child, with a sturdy hip belt providing excellent weight distribution, and an adjustable seat with a three stage hook-n-clip system that ‘grows’ with your child. It includes plenty of handy compartments for carrying all of your essentials, plus a detachable daypack which can easily be taken off if you need to lighten your load. The Vamoose also comes with a Sombrero sunshade and Rainbow rain cover and is compatible with an optional child neck pillow. Take your little explorer along for the adventure with the Vamoose. This market-leading child carrier has been taking children along for the ride for many years and has been updated for 2016 to even further enhance comfort. This season, it has a simplified frame, reduced weight, improved stability and a fun and colourful ‘Kiwi’ cockpit print. Strong and durable, the Vamoose has a storage capacity of 19L and can handle loads of up to 20kg. It’s comfortable for both parent and child, with a sturdy hip belt providing excellent weight distribution, and an adjustable seat with a three stage hook-n-clip system that ‘grows’ with your child. It includes plenty of handy compartments for carrying all of your essentials, plus a detachable daypack which can easily be taken off if you need to lighten your load. The Vamoose also comes with a Sombrero sunshade and Rainbow rain cover and is compatible with an optional child neck pillow. How does the v2 compare to the original? I’ve seen many reviews that complain the hip belt is not connected to the pack (it just runs through a loop), and there are no longer 2 sizes causing the metal bar to dig into taller people. Sorry that I can’t really compare the two because I’ve only owned the Vamoose and my daughter is now trekking independently. I did love mine when I had it, and found it so comfortable that I’m sure my daughter rode in it for at least a year longer than she needed to! I don’t know how this brand isn’t more widespread. We were in the UK out hiking and we ran across a couple hauling their child around in a Macpac. It was soon clear that the sling we had was not ergonomically suitable for hiking with our daughter so we ordered up a Macpac (this back in 1999) and used it non-stop until my daughter was able to walk on her own even after we moved to the US. Always hoped to put it to further use but eventually had to face reality and donated it. Well, it turns out we’re in the market again so I’m starting to do the research. Looks like there have been some improvements. The extendable legs are a definite plus. I hope it’s at least as comfortable as the original. I loved reading your story and congratulations! There is nothing more amazing than sharing outdoor adventures with very young children, and Macpac carriers smooth the way, enabling us to get our thrills and introduce our babies and kids to the joy of being in nature. We are about to tackle a 40-day trek across the Nepal Himalayas with our six-year-old daughter and she couldn’t be more excited about it. 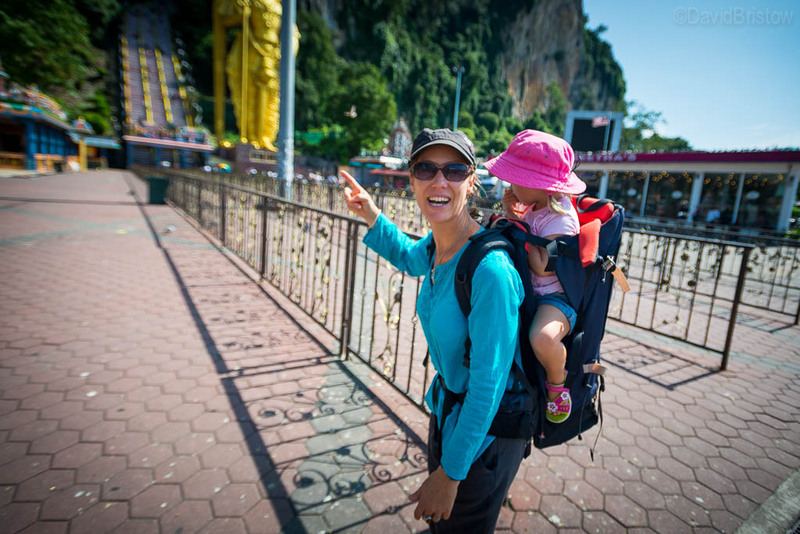 It all started with that awesome Macpac carrier…here’s to another great journey with your new trekker!